Choosing or counting – out rhymes are an important part of childhood. If a game is being set up and nobody wants to volunteer for a particular part or position, then a selection rhyme is used to choose one from the group. All rhymes begin with the players in a circle. Then one of them, the singer, begins the rhyme and points around to the left or to the right, until they get to the end of the song. Whoever is being pointed at during the last word is either chosen or eliminated depending on the version or how the children choose to play. When you sing this as a choosing game, you break it down by word. It's said like this below. On each line you're choosing a different one. Sometimes people are counted and sometimes each person’s hands, so that you are only safe once both hands have been removed from the circle. 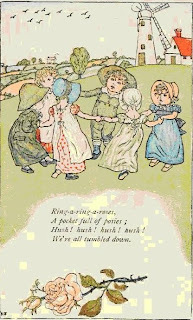 "Eenie, meenie, miney, moe," is the most popular selection rhyme. It was first used in the 18th Century and there exists multiple versions differing from region to region. Some of these variations of the chants are also used to choose who would be “it” for games of tag or hide and seek. Below there are some versions. Take a stick o' bubble gum. But it is not clear its origin if it refers when slaves were captured in Africa or when they ran away from plantations. In any case children sang the rhyme that way. Maybe some other time I would write about other counting rhymes. I find them very interesting. Por fin soy la primera. ¡Lastima que no pueda enterarme bien de lo que pone tu post. ¡cachis! La flor del post anterior es preciosa ¿no se te parece a alguien? ¡¡¡SÍIIIIIIII!!!!! adivinaste. Era fácil, sólo tenías que mirar tu espejo. Love You y no me trabajes tanto. If I were a child I would like singing and singing that lirycs. Well, I am a child but I have lost my voice. Thanks a lot for your comments.I'd like to answer the kind commentator who asks me how long did it take me to write this post. Well, It was quite a long time ago and I can't tell you exactly but I can assure you that I always think about what I am going to write and try to prepare it thoroughly, it involves information first and then writing it in English, which is not my mother language as you can see and it requires a further effort. So, many times my posts are not very successful and I feel they would be better in Spanish but I try it hard in English. Sorry, a very long answer.